How tight is The Mother of All Byelections ™? Within the margin of error. 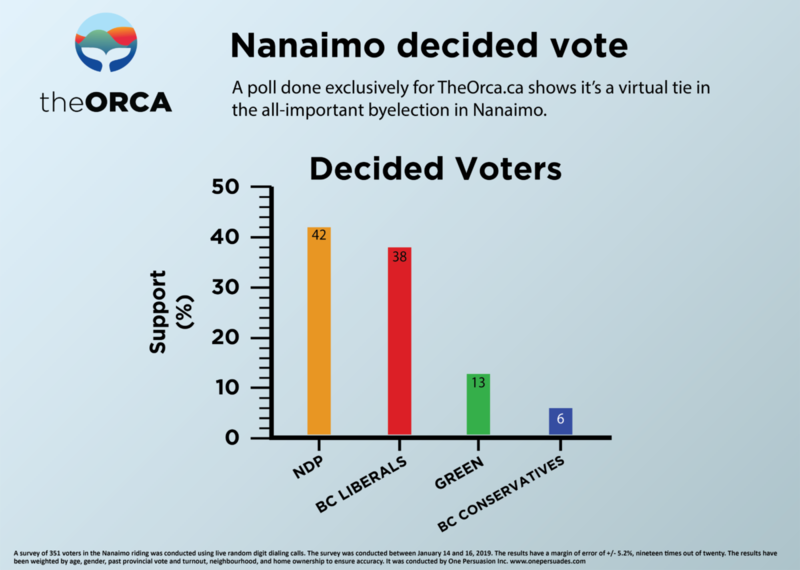 The Nanaimo byelection is a virtual dead heat between the NDP and BC Liberals, according to a recent poll done exclusively for The Orca. The NDP’s Sheila Malcolmson has a slight lead, with 42% of decided voters. Just behind them is Tony Harris of the BC Liberals, with 38%. With just four points separating them – within the poll’s 5.2% margin of error – the byelection is a statistical toss-up. Significantly, this poll was mostly – but not completely – conducted before news that all Nanaimo homeowners must submit forms proving they are not speculators, which may dent NDP support. The BC Liberals are doing a better job retaining their 2017 voters, with 91% of those who voted BC Liberal in the most recent provincial election saying they’ll vote the same way in the byelection, compared with 77% of NDP voters. Despite touting an internal poll earlier this week – in a tweet which appears to have been deleted – portraying a tight three-way race, this poll placed Green candidate Michele Ney far behind, at 13%. In fourth place are the BC Conservatives At 6%. Assuming their support comes at the expense of the BC Liberals – a big but not wholly unreasonable assumption – they are polling just enough support to put the BC Liberals in second place. It’s reminiscent of Courtenay-Comox and Maple Ridge-Mission in 2017, where BC Conservative candidates split the centre-right vote just enough to elect the NDP. While byelections often struggle for attention, with so much on the line, awareness is unusually high. Nearly two-thirds (65%) say they’ve heard, read, or seen a lot (33%) or a moderate amount (32%) about Nanaimo’s byelection. Awareness was highest among older men, and BC Liberal voters. Turnout should be much higher than normal for a byelection. Respondents were asked on a scale from 0 to 10 how likely they were to vote. 65% responded 10 out of 10, which our pollster projects to a turnout of approximately 52%. In the 2017 provincial election, turnout in Nanaimo was 62.3%. The survey, done on behalf of The Orca by ONE Persuasion Inc., of 351 residents of the provincial riding of Nanaimo was conducted using live random digit dialing calls, between January 14 and 16, 2019. The results have a margin of error of +/- 5.2%, 19 times out of 20. The results have been weighted by age, gender, past provincial vote and turnout, neighbourhood and homeownership to ensure accuracy. 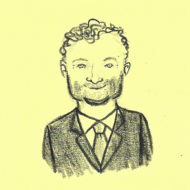 The full report from ONE Persuasion can be found Nanaimo Results. For the poll’s cross tabs, click Nanaimo Tabs.